This picture, taken by White House photographer Pete Souza back on December 21, 2010, was released this week. 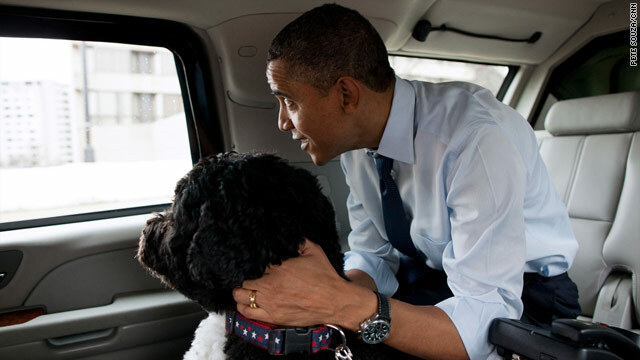 It shows the President and Bo, the Obama family dog, during a ride in the presidential motorcade en route to PetSmart in Alexandria, Va. The President bought Bo some Christmas gifts at the pet store then walked nearby to Best Buy to purchase gifts for his daughters. Okay, let me be the first to say it – Awwwwwww!!!! Even my mother thinks Bo is cute. We both think the President is one handsome fella!!!! Proof that sheep can and do live under rocks. Also, what do you stand for? "Proof that sheep can and do live under rocks." "That poor dog. Somebody should call the humane society..."
"I love my dog, too, but we both know Obama loves his sheep more. Baaaaa." Keep bleating about how everyone else is a sheep, it really helps your case. That's where Trolls live until THIS man was elected. Also, please share with us why you support Obama. I have politely asked several people, and they resort to sheepish name-calling. I'm desperately looking to engage into an intellectual conversation with a singe Obama supporter. I wonder why it seems impossible. Oh poo Jason. Just because I think the President is handsome and Bo is a cute dog does not make me a sheep. Get a grip!!! I stand for a lot of things, none of which concern you. But let me say one thing I do stand for is not making inane comments about posters simply because YOU do not agree with their support of President Obama. I am with you there Joi, mmmmh.. so cute, now let us sit back and watch those raving in ENVY, in no minute jeaulousy will be making the rounds! You thrive on envy? You sound like a typical self-important liberal who hates people only a little bit less than you hate yourself. The only eny people have is of a truly free society that adheres to the constitution, and of a county that is not violently bankrupt. What do you stand for? 1. preoccupied with one's own interests, often disregarding the truth or the interests, well-being, etc., of others. 2. serving to further one's own selfish interests. Ok, Republican hates liberals because we want to feed the starving, house the homeless, employ the unemployed. Now Republicans don't want to pay their fair share of taxes, they want the starving to fend for themselves and get off the government support because you don't want to pay for it. NOW THAT IS SELF SERVING. By Golly Joi Gibson, the evil ones already beat me to the count, already their SATANIC VERSES have hit the posts! You said by golly. Are you an elderly person who might have accidentally been seduced by pretend money and pretend freedom? A man of strength and character loves his dog and don't "hang them from the roof of a car"
Since you asked Jason. Yes Old, wise, cultivated and devoid of sheepish brain. I know, the diffrence struck you- a classy thing, hmmmm smell the fresh air Jason. You may cultivate your sheepish brain mentality too you know and take pride in putting up postings with a bit more substance and facts!! Give up the sewer that is your habitat Jason. George, please list 3 things Obama has done for this country which strictly adheres to and shows appreciation for our constitution. Also, please name 3 or more promises that Obama has followed through on. In addition, how do you feel about NDAA and SOPA? @Jason FYI he has accomplished a great deal...and remember he was elected president...and in so doing he swore to uphold the constitution which he has. I'm sick and tired of people asking "What has Obama done?" So here's a list of things he's done since he's been in office. Remember: He was elected President. He wasn't elected Jesus! The list is still growing. Let me know if I missed anything. 12. Renewed dialogue with NATO and other allies and partners on strategic issues. 13. Beginning the process of reforming and restructuring the military 20 years after the Cold War to a more modern fighting force… this includes new procurement policies, increasing size of military, new technology and cyber units and operations, etc. 21. . Ended media blackout on war casualties and the return of fallen soldiers to Dover AFB. 25. American Recovery and Reinvestment Act has created 2.1 million jobs (as of 12/31/09). 29. . Launched Recovery.gov to track spending from the Recovery Act, an unprecedented step to provide transparency and accountability through technology. 38. . Provided the Department of Veterans Affairs (VA) with more than $1.4 billion to improve services to America’s Veterans. 43. . Launched Business.gov – enabling conversation and online collaboration between small business owners, government representatives and industry experts in discussion forums relevant to starting and managing a business. Great for the economy. 46. Changed failing war strategy in Afghanistan. 49. Donated his $1.4 million Nobel Prize to nonprofits. 51. Provided tax credits to first-time home buyers through the Worker, Homeownership, and Business Assistance Act of 2009 to revitalize the U.S. housing market. 55. Cracked down on companies that deny sick pay, vacation and health insurance to workers by abusing the employee classification of independent contractor. Such companies also avoid paying Social Security, Medicare and unemployment insurance taxes for those workers. 58. Protected 300,000 education jobs, such as teachers, principals, librarians, and counselors through the Recovery Act that would have otherwise been lost. 60. Children’s Health Insurance Reauthorization Act on February 4, 2009, provides quality health care to 11 million kids – 4 million who were previously uninsured. 66. Announced creation of a Joint Virtual Lifetime Electronic Record for members of the U.S. Armed Forces to improve quality of medical care. 71. . Negotiated deal with Swiss banks to permit US government to gain access to records of tax evaders and criminals. 74. Provided tax credit to workers thus cutting taxes for 95% of America's working families. 80. Provided attractive tax write-offs for those who buy hybrid automobiles. 83. Unveiled a program on Earth Day 2009 to develop the renewable energy projects on the waters of our Outer Continental Shelf that produce electricity from wind, wave, and ocean currents. These regulations will enable, for the first time ever, the nation to tap into our ocean’s vast sustainable resources to generate clean energy in an environmentally sound and safe manner. 89. Ended the previous stop-loss policy that kept soldiers in Iraq/Afghanistan longer than their enlistment date. 95. . Signed the Weapons Systems Acquisition Reform Act to stop fraud and wasteful spending in the defense procurement and contracting system. 107. HEALTHCARE REFORM...The Affordable Health Insurance Act of 2009. And this is a list that is being added to every few days. Item #7- The Noble committee has the right to do whatever they wish with their property but Obama was nominated while serving less than 2 weeks in office! This was before he had any accomplishments as President! A prevailing thought was he won because he was not Bush! President Obama has awarded a no-bid contract to KBR Inc. for $568 million. That’s more than 20,000 times the maximum he set for a no-bid contract. Item #97- you're kidding, right? Does this president deserve credit? ..yes he does, as does ALL presidents do! IMO the unobjective lovefest from the left is just as pitiful as the unobjective hatefest from the right! Folks don't know how to be objective anymore! My point is some items on your list is correct and some are not! CONDUCT UNBIASED RESEARCH FOR YOURSELVES, PEOPLE! This is no reason to vote for or against him! BTW, Why is everybody getting so worked up over a picture that was taken in Dec 2010? And a brain made of jello to think that a photo op with a pet redeems violations of our constitution. What gets more of your attention, mina? Happy pet pictures, or cold hard realities? Bankruptcy is not sustainable and does not begin to explain the mess we are in. What are your feelings on NDAA and SOPA? Have you ever considered that sometimes the only way to bring a law to the Supreme Court is to sign it into law and let the court settle it? And correctly it is NDAA the National Defense Authorization Act. But why? Give me one reason. Because he beats anything the Repukes can offer. And you do understand that your president enjoys spending 5 billion pretend dollars every day, right? Im willing to be that you have felt the affects of inflation in several ways. What about NDAA? What about SOPA? Where do you stand? Agreed. Let's keep moving our country forward, not backwards. Obama 2012 for sure. He will win, just wait and see. Now I guess I'm to believe the dog goes every place he goes....PHOTO OPP! FAKE! jerry = total putz. You need to get a life....real bad! about as pathetic as it gets. No jerry it's the foul stench and the flies buzzing around you!! Even Bo knows that it's wrong for his owner to pick up his droppings with the constitution. great picture and all politicians use photo opps. So what? This is a nice one. Election years sure are filled with Kodak moments.. Get real. Your president has spent more pretend money than has been spent between George Washington and bill Clinton. He wants another 1.3 trillion for this year. He broke almost all of his promises. Are you dense or do you simply wish for the demise of my country? See Jason, you would not believe that G.W. mess is done with would you? Cleaning is still going on, then there is investment to be made in our infra structure, research and development including education. I suppose you have no idea what that is. The good news is that money is being spent right here in the US and not used in Iraq!! George, Obama has broken every promise. He has spent more money than was spent between George Washington and Bill Clinton. Bankrupts doesnt begin to describe the mess we are in. How can a country that is $16,000,000,000,000 ($70,000,000,000,000 realistically) in debt be printing money for aid to Israel and Pakistan, and others? How do you feel about NDAA and SOPA? Please also give me 3 examples of how Obama adheres to the constitution in his actions. I just feel like your appreciation for this picture must represent a complete disregard for the realities that are taking place outside of the armored dear leader mobile. What do you stand for, other than simple things like companionship with pets? Is that "Ron Paul 2012" in doggy speak? No the poor thing got alarmed by the gop excesively CIRCUS ATTIRE! Did you say it turned out it was ron paul! Love the patriotic collar on the First Pooch! Isn't that cute? Know what else is cute? The pooche' owner. That silly guy went and printed more pretend money than was printed between George Washington and Bill Clinton. I love my dog, too, but we both know Obama loves his sheep more. Baaaaaa. That is because George W. Bush had spent soo much pretend money...RIGHT? at least President Bush once made a living outside of govt.. Even had a real resume'. How else would you think otherwise jason with that sheepish brain that you have? Every day lawyers and writers make a living outside of government...what is your point? Does living off your dad's reputation as president qualify as making a living? Oh right...George W was a government employee in Texas, and that Texas Ranger deal still smells to high heaven. @jean.... you need to read President George Bushes bio...then speak. As a result of reading obamas diatribes I have come to the conclusion he is not good for America. he is a leftist radical, he does not have an American brain, and he is a narcissist (very ill with a personality disorder). I also know about his gene pool...and that makes me sick. In about every way obama comes up very short in comparison to the Bush family....a family of generations of service to our county in and out of the military. You and others in your hatred of conservative thinking/moral people are easy to brain wash...as obama and that mob have done. No need for all that long rumble jerry anyone who gives a thumb's up for G.W. Bush has qualified himself and earned a place a longside him. Meanwhile you may call this President all those names the much you like,a leftist communist,a Muslim out to harm the country, fake birth certificate etc. you are not alone at that, other embiciles do too! Again Jerry this is for the records, no one is contesting Bush' genes or how his poops looks like. History has him as the worst US President. His performance at the white house was plain DISMAL period! Karen, in what part of any of my replies gave you the feeling that I was endorsing Ronald Reagan for president. Lets leave google along and not get too far ahead of ourselves. Let's first pay attention to the replies, have a coherent thought process, and carefully execute our responses to Taylor the needs of the questions and statements. Karen, please provide 3 campaign promises that Obama followed through on. Please gives 3 examples of actions that where your dear leader displayed adhesion and great respect for our constitution. Also, what are your feelings on NDAA and SOPA? Have you read: Neck Deep: The Disastrous Presidency of George W. Bush? Or type Bush family corruption in your search engine and you will get about 3 million hits. Many of you are probably to young to remember how President Regan was treated...it was horrible. The lefties and the media just ripped him apart every chance they got...Nancy too. At the base of it all was a good man who loved his country and worked decades building a resume' to enter the white house. Many of you have grown up in this slick media age and by the candidates hipe and media facade...I really wonder how many of you have ever taken the time to read a novel, say a biography..or even know how to assemble facts and arrive at an independant opinion...you just listen to the radio and tv hype and manipulation and go with what makes you feel good or seems to (at the short term) benefit you. You are ripe for politicians like obama, reid, pelosi, and frank...they say what you want to hear and then stick it to you as it benefits them (their thurst for power). What is a blanket with "starts"? sorry...its a blanket under the saddle. A reference to the O"Barry dogs collar... this guy never misses a staged photo opportunity, reminds me of bill clinton and the film clip when he was caught chewing out an aid for not presenting him in a better way... these type of politicians are very carful to stage their personas...phoneys! Don't you ever think beyond spewing trash Jerry? Sewer express seems to be your speciality I understand that you relish thriving in murk, but see, we can't stand the foul smell and the flies buzzing around you! Not all have gas mask to get through you. @geraldine...What type of politicians are a carful? I understand Barney and Miss Beazley had their own website. Well since you suggested it Jerry.." the girls on a pony.." why not? To have you, run along after the pony, picking up it's manure for your dinner. See. you just earned yourself a job Jerry, whats more you thrive best under those circumstances! @george...just another angry sick little boy aren't you George? Did you use 9 exclamation marks out of enthusiasm, or desperation? Bo would tell you about his unfavorable views of his owner, but NDAA got in the way. Bo is a totally awesome creature; love him, love him, love him. And, I am also very fond and proud of the President. Obama in 2012 !!! You seem pretty excited. Well, how do you feel about NDAA and SOPA? Hope and change? You all are familiar with the political workings of Nazi Germany, correct? Research has found that those who will label something as ignorant rarely have a basic understanding for the things which they deem as ignorant, and by the laws of irony, you are in fact the ignoramus. Quick!!! The president is trying to strangle that poor dog!!!! "Where is the Secret Service when you really need them?" – that wasn't my thought but the dog's. obama/biden into private life 2012!!!! Please provide 3 reasons why you support Obama and also please explain how and where Obama displays great adhesion and respect to our constitution. In addition, please give 3 or more examples of campaign promises kept other than to violate Pakistan's sovereignty to get the evil doers. Please provide 3 reasons you support the idiot you support. 5, 6 and 7 He is not Obama i.e. libs don't like him, though many do (just had to throw that in there for the wool over the eyes blind followers). Now, back to the original question...can YOU name 3 reasons?? Know the difference between Obama and Bo? Bo has papers. and Pelosi says "obama needs to run against the senate". Don't worry nancy he will...as he ran against President Bush..not McCain. This guy always needs a vilian...leftists operate tat way, they can't run on their records or truth...always a manipulation. Fact is obama has many of you fooled...but, most of us are in the mode: fool me once shame on you fool me twice...well, you get the point...we have his number. NObama NOvember 2012! Oh I think he can do very well just running against whoever the Repukes put up. How? Without doing things like this phoney picture...posted by CNN? Run on his wonderful record domestically and over seas? Maybe he can brag about having the Libyian leader killed and debate the legalities of that mess...as nut cases like you did for President Bush...eh? There is the old saying that empty jerrycans make the most noise and how true today that this empty Jerrycan reminds us of that. Just look at the dismal gop circus criss crossing the country and one would understand the frustration of the likes of jerry. The scenario here is a case of gop supporters frustration giving in to desperation. Hence the mud slinging, bad mouthing, nit wit comments and all negative vibes these gop resort to against the President. They can feel the tsunami wind coming to erode the gop house majority along with that zero speaker of theirs whose only accomplishment is weeping in the house. Gee Pelosi is man enough! The gop's may howl at the top of their voices, cast murk and or whatever deep inside they know all is in vain...Watch Obama/Biden romp in 2012 victory!! Just ask Bush/McCain/ Palin !! "America will never be destroyed from the outside. If we falter and lose our freedoms, it will be because we destroyed ourselves. " Your president ran on hope and change and bashed President Bush for many of the things he now does in mass...he is what he is and you bought his snake oil salesmanship...so sit up straight and take it like a man, if you can. The obama hype experiment is over, the real thinking voter has his number and the voting of last fall proved that... obama and many of the GOP who have not done what the voting public want will go to the curb this fall. Amen! When all is said and done, remember Bo is riding inside the vehicle not strapped to the roof. You can tell a lot about a person by how they treat their pets.